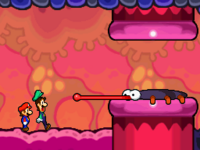 Scutlet is a large cockroach-like creature found stuck inside Bowser's body in Mario & Luigi: Bowser's Inside Story. In English, it shares the name of its species, but it is named differently in the Japanese version and in some other localized versions. 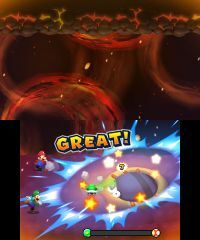 The Scutlet found in Bowser's body has grown much bigger than other members of its species possibly due to it feeding on Bowser's Flame Pipe, and it has also gained a long tongue. Scutlet prevents Bowser from breathing fire by blocking a hole inside his body, which produces the fire. The Mario Bros. investigate, and discover Scutlet, who scares Luigi away and then eats Starlow. They fight with Scutlet to allow Bowser to breathe fire and to free Starlow. In battle, Scutlet has three attacks. One attack involves Scutlet sticking out its tongue in hopes of eating one of the bros.; the way its eyes point is a sign about who it will attack, and its tongue can then be dodged with a jump. In the next attack, it wraps its tongue around Starlow and throws her in the air in an attempt to hit Mario or Luigi; this is countered by a hammer swing, which causes Starlow to get angry at either the bros (if successfully countered) or Scutlet (if they fail to counterattack). Finally, Scutlet gets ejected into the air by Bowser's flame breath, and drifts down towards either Mario or Luigi; this can be jumped over, causing no harm. When Scutlet is in the air, it will look either up or down, showing who it will attack (up for Mario, down for Luigi). Once Scutlet is defeated, Starlow is set free and Bowser can breathe fire again. Later in the game, more normal-sized Scutlets appear outside of Bowser's body in Dimble Wood, Bowser can simply defeat these enemies by walking into them and he'll get five Coins though Mario and Luigi actually have to battle them. Spanish (NOA) Piojuela Composed by piojo (lice) and -uela, a suffix that is used to mean "little" or "a bit". The suffix could also come from juela (flake) or sanguijuela (bloodsucker). Neobjeokchungi From 넙적 neobjeok, meaning "flat", and 충 chung, Korean reading of 蟲, which means "a bug". Scutlet is the only required boss that Mario and Luigi do not fight in the Gauntlet (not counting Chakron and enemies Bowser inhales during his boss battles). Scutlet is not harmed by the fire in Bowser's flame pipe, but is harmed by fire from Fire Mario and Fire Luigi. This page was last edited on March 11, 2019, at 17:36.